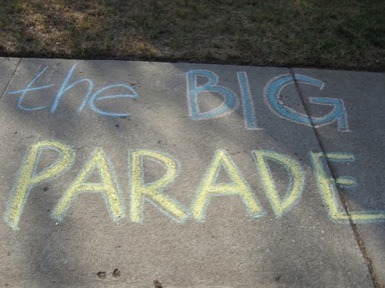 THE BIG PARADE: 2 days, 35 miles, and 101 stairways. Plus, our 2nd contest winner! Go Go’ers, for additional proof that the City of Angels is awesome sans autos, check out The Big Parade II this weekend. Organized by writer Dan Koeppel and led by Bob Inman, author of A Guide to the Public Staircases of Los Angeles (Blurb, 2009), the second annual, two-day, 35 mile, FREE walk starts at the Angel’s Flight in downtown Los Angeles on Saturday morning, ends in Beachwood Canyon below the Hollywood sign Sunday afternoon, and includes 101 stairways. That’s right, Go Go’ers: 101. As in Dalmatians…. If you’re seeing spots and your knees are buckling at the very thought, rest assured that the Big Parade is not a Forced March of Fun nor an endurance marathon for muscle-y hardbodies; everyone (including muscle-y hardbodies) is encouraged to participate. The schedule is designed in five-mile loops to provide easy meet-up spots; you can join the parade route for an hour, a mile, a few stops, several staircases, or the whole shebang. Long Distance Walkers, who are (impressively!) doing both days, all 35 miles, and all 101 stairways, have priority at the pre-booked, Silverlake Recreation Center’s “campsites” Saturday night. No word yet on the rec center’s weenie roast and s’mores policy…. Other features of the parade (per the Big Parade II website): a special children’s walk Saturday morning; a “‘backcountry’ bushwhack along a secret dirt road between Silverlake and Echo Park”; a “cross-country segment that runs through Griffith Park”; and a “sightseeing list” of 30+ items that includes the Los Angeles Central Market, Richard Neutra houses in Silverlake, and “just-plain-weird” landmarks. The latter, of course, being Ms. Go Go’s cup of tepid canteen tea…. Go Go’ers, book your Monday massage now…. Congrats, Pat! Thanks for participating and for reading U Want 2 Go Go! Previous Post VENICE BEACH PUB CRAWL SCAVENGER HUNT: Don’t just stand there drinking…do something!